BodyPositive: Deliciously Ella's Alternative Pancake Ideas! In honour of Pancake Day, BodyPositive friend, blogger and foodie, Ella Woodward, brings you these delicious pancake recipes packed with healthy, energy boosting ingredients! These pancakes are the best healthy spin on the classic sugar and lemon pancakes! Each pancake is just bursting with flavour - the richness from the cardamom works so well with the zestiness from the lemon and sweetness from the honey. The drizzle is made with more lemon zest, honey and coconut oil to create the most perfect contrast in flavours! They're so delicious, you can enjoy them throughout the year too, not just on pancake day - they would make the best breakfast or sweet dessert! Combine 2 tablespoons of chia seeds with 4 tablespoons of water and leave to sit in the fridge for about of 30 minutes. Firmly press down on each cardamom pod with the flat side of a sturdy knife. Open the pod and pick out the seeds, discarding the outer shell. Either carefully roughly chop the seeds with a knife or grind them using a mortar and pestle. Zest an entire lemon and set aside half for the drizzle. Mash the banana in a bowl and then add all the pancake ingredients to your blender. Blitz well until everything is combined. The consistency should be nice and thick. Heat the coconut oil over a medium heat in a non-stick pan. Once melted, use about a ¼ cup of the mix and pour into the pan. Heat until bubbles form about three quarters of the way cooked through and then flip to cook for another minute or two. Repeat with the rest of the mixture adding more coconut oil when the pan dries out. The mix should make 5-6 small pancakes. Then simply combine all of the ingredients for the drizzle together and stir well. Stack your pancakes and pour the zesty honey drizzle on top! Melt in the Mouth Banana Pancakes! This blend of oats, almonds and flax makes each pancake brilliantly thick with a perfectly warm, squishy middle - just like good American pancakes. Topped with fresh blueberries, walnut pieces, sliced banana, strawberries and a little extra maple syrup they are just divine and they literally just melt in your mouth! They're super healthy too so now you can enjoy this awesome day of sweet indulgence without worrying about the consequences! The oats and almonds also mean they're perfectly filling, so you really can't eat a hundred - although considering how good they taste I'm sure you'll want to! Slice the bananas, adding them and the remaining ingredients (except the blueberries) into the processor with the oats - blend until a smooth mixture forms. The mix should turn out nice and quite thick, not too runny. Transfer the mix out of the processor and into a mixing bowl, this makes putting spoons of it into the pan so much easier. If you're using blueberries stir these through now. Place a saucepan on the heat for a minute or two, once it is really hot add a teaspoon of coconut oil to the pan and allow it to melt. Once it has melted add a quarter of the mix to the middle of the saucepan, using your spoon to shape it into a spoon. After about a minute check the bottom of the pancake, if its cooked then flip it over and allow the other side to cook for another minute. Then remove the pancake, add another teaspoon of coconut oil and go again! Cover the stack with maple syrup, blueberries, walnut crumbles and strawberries and serve! 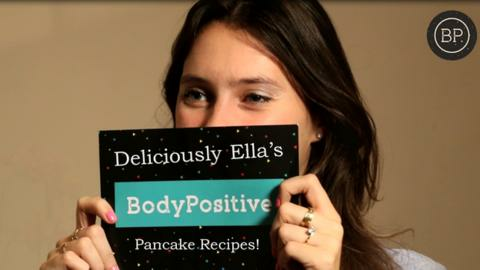 Follow Ella on Twitter and Instagram for more simple healthy recipes! Mel Wells' Healthy Breakfast Ideas! Read more on BodyPositive: Mel Wells' Healthy Breakfast Ideas!